Hello all. I just realized it has been far too long since my last post and with the impending birth of my 5th child, you might not hear from me for a while! My due date is tomorrow, Oct. 6. I shouldn’t be surprised that I have made it to my due date, as I was 5 days late with my last baby. The nursery is all set, clothes are washed and folded neatly in her drawers, I even started and finished a DIY project! 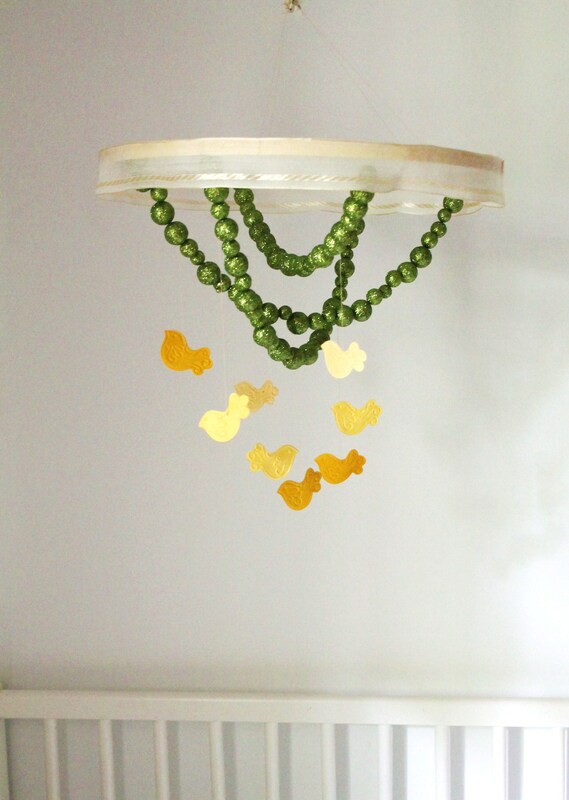 A cute little mobile to hang above the crib. 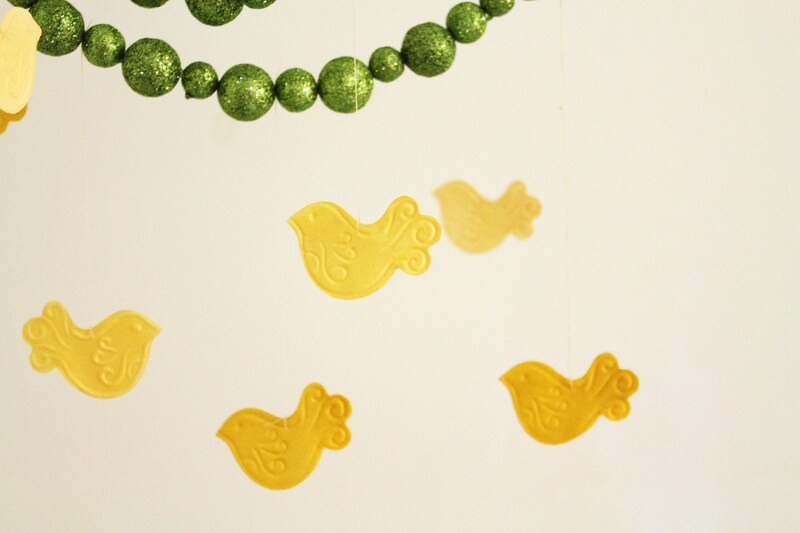 Aren’t the little birdies just adorable?? I made this with about $5 of craft supplies! It’s not perfect, but indeed not overly-priced and cheesy like the in-store options. The rest of the nursery is up-cycled thrift store finds and old family furniture repainted. It’s simple, charming and comfortable. I’m feeling great these days, spending most of my time in a vicious cycle that looks a bit like this: baking, cooking, cleaning, baking, cooking, cleaning. It’s exhausting, but for some reason I can’t stop. They call this “nesting”, and it seems to have hit me hard this go around. My husband is thoroughly enjoying my new “ocd” ness. However, he knows it won’t last long…. Another thing to think about… when you have food restrictions, it is really hard to rely on others to prepare meals and food for you like you normally would. My husband is a fantastic cook (former chef) and I know he will prepare delicious food for me, but the baking…. I must do myself. So I have stocked my freezer with a few staples (mainly baked goods) Cheddar biscuits, pecan brownie bites, waffles, homemade chicken broth, crepes (recipe coming soon) and my latest creation pumpkin streusel muffins… which are so divine, I thought it would only be fair to share with you right now and not make you wait for what may be an eternity til I’m back blogging! Prepare streusel topping. Stir together all ingredients with fork. Set aside. Prepare muffin base, whisk together pumpkin, eggs, oil, and honey. Add dry ingredients and whisk well to combine. Scoop into greased or lined muffin tins. Crumble topping onto each muffin. Bake for 20-30 minutes depending on size of muffin until toothpick comes out clean. Serve warm, room temperature or keep in the freezer for a special treat! And if you have not done so before, I urge you to roast and make your own pumpkin puree. The flavor is unmatched and you will never go back to the canned stuff. Recipe can be found —–> here. I also wanted to thank those of you who have sent emails checking in on me and the status of my health and pregnancy. I’m happy to report the Crohn’s has been very quiet and am hopeful it will remain that way! I will update you all as soon as baby is here and I have a few minutes to share the news. This entry was posted in Gluten Free, Life and tagged gluten free, grain free, paleo, scd. Bookmark the permalink. 15 Responses to Pumpkin Streusel Muffins and my 40 week update! Oh I am making these ASAP. Can’t wait. I have no idea how you get so much cooking done with 4 kids running around. I am surprised they don’t gobble everything up before you can freeze it! I only have 2 kids and I feel like I have a circus in my house some days. Oh, you sound just like me when I’m waiting on my babies. I have four ages 5 and under, and I have my babies at home, so I’m so obsessed with everything clean and perfect for my labor and birth. We’re also gluten free (as well as organic) so I also cannot rely on anyone to bring food to me, so I load my freezers before babies. This last time, I actually had a notebook with charts for each and every meal for 4 weeks so my husband knew what to bring in to thaw for the day. I ended up with more than 6 weeks worth of meals. It was wonderful! 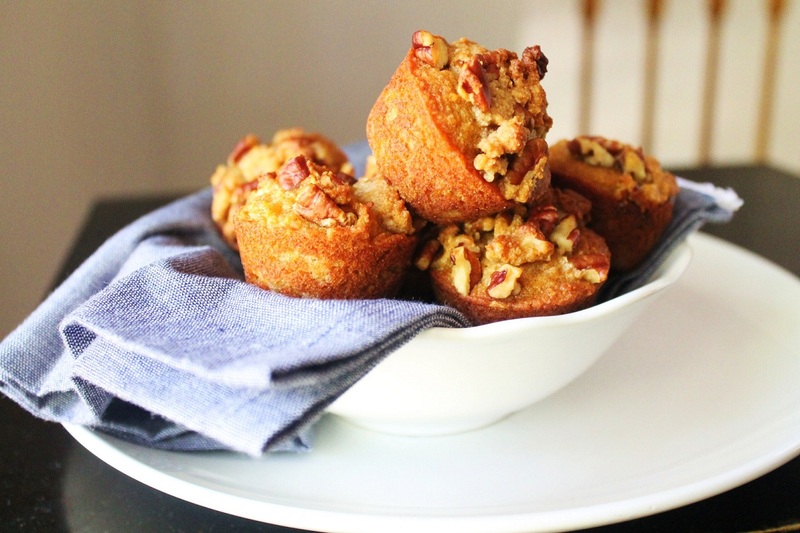 I’m going to have to try these wonderful muffins! Thanks for the update, and best wishes for a beautiful birth! You are so stinking cute with your pregnant belly there! ;) I keep expecting to see a little announcement on facebook…any day now, I guess. Oh…and I meant to say, Love the nursery and your DIY project. It turned out really cute. When I gave birth to my fourth I didn’t know how it would go with half of our family being grain free at the time, but our friends and family were very wonderful and accommodating and managed to make us wonderful food we could all eat. I hope that you’ll find the same to be true for you. Blessings! I can’t wait to make these! 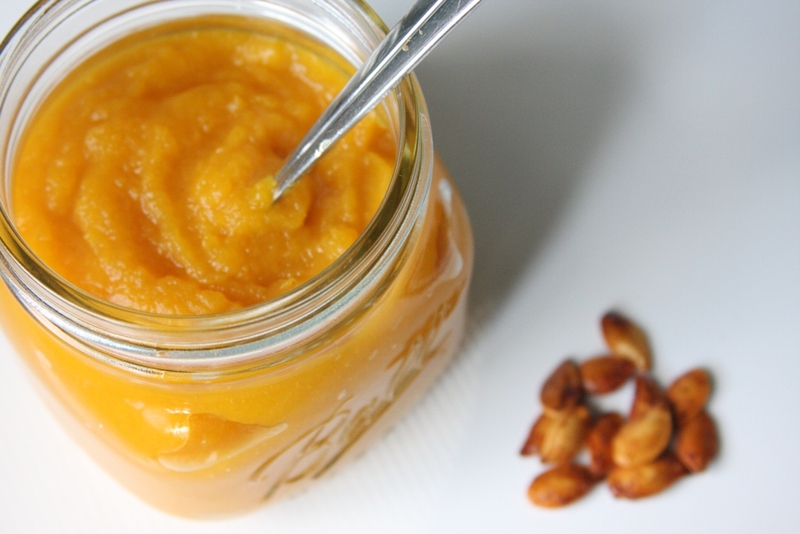 I decided to follow your fresh pumpkin puree recipe though because it seems so simple. Then I can make your pumpkin seed recipe!! I can’t wait! Best wishes on a speedy delivery and a healthy addition to your lovely family! I tried your 50/50 almond flour and coconut flour in my apple crisp recipe last night, in place of the flour I usually used, kept everything else same, except used GF oats, etc. WHICH FLOUR is likely to be the tiny, grainy feeling one, after we ate it. Husband thought the apples were bad :) i didn’t tell him I subbed in the GF flours. Your blog is GREAT!! Wonderful recipes! God bless you as you welcome your baby into your family! Children are a blessing from the Lord!! Congratulations on your 5th blessing!! These turned out great! They are some of the lightest almond and or coconut flour baked goods I have made. I added some orange zest and a tablespoon of orange juice to mine.. I did have a problem with the struesel topping rolling off of my muffins, noooooo! In order to avoid this I think I Will make the next batch in an 8×8 inch square tin, hopefully the top will be flatter, avoiding the loss of precious struesel topping! Just made these. So good! So, so good. I didn’t have ginger so I used ground clove and allspice instead. Took the suggestion to add orange zest and about a tablespoon of juice. I also didn’t want to lose my strudel so I just barely pressed it into the batter. I let the edges crisp up good. Just ate two right out of the oven. Yum! looking for a pumpkin recipe and here it is!! am going to bake it now as it is chilly and blustery over here in the uk. good luck with everything. you look absolutely adorable. well done!! I have been trying out your website along with others since my daughter and granddaughter were told they had to stop eating all grains and dairy. I have been on this diet for about 3 years now, but I was not motivated to bake for myself, and no one else seemed to interested in following my restrictions! Today I made the pumpkin streusel muffins, using pumpkin seeds instead of nuts in the streusel. My husband who is a very picky critic just suggested that he could roast another pumpkin so that I could make more. He said now that I have a winner I should just keep making them again and again. I think he is thinking that by the time I see the kids later this week the muffins I made will be all gone. I think that I will make this recipe one of my favorites, but I will still try out a few other recipes. …sorry, my fingers got all excited and I seemed to have clicked the enter key. I just wanted to say how much you inspire me. I have been really ill and am now pregnant with my fifth child. Also on my own decided to try to regain health bough foods an your blog has been so helpful and a confirmation it can be done. Thank you so much and I hope all is well with you and your family.